Stream any audio from your Mac all around your network. Send music services like Spotify or web-based audio like Pandora wirelessly to all sorts of devices, including the Apple TV, HomePod, Google Chromecast, Sonos devices, and Bluetooth speakers. You can even send to iOS devices and other computers. Any audio on your Mac can now be heard throughout your house! 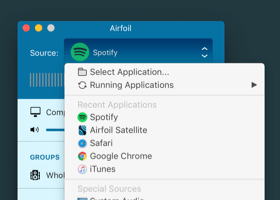 Use Airfoil to stream any audio playing on your Mac, from music services like Spotify and Pandora, web-based audio from Safari or Chrome, or anything else you like. Stream the music you love to speakers all over the house. Everything will play in perfect sync, even between different speaker types. Airfoil Satellite is a free companion for Airfoil, available for iOS, Windows, and Mac. Receive audio and remotely control Airfoil on your iOS device or other computer! Configure Airfoil to auto-transmit on launch, and you'll be streaming audio around your house just by opening the app. 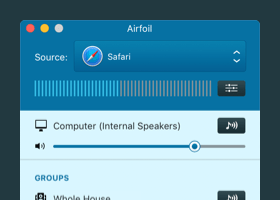 With the silence monitor feature, Airfoil can automatically disconnect when silent audio is streaming. Send to multiple outputs with just a click. Create a group for all the speakers in your house, or make multiple zones. Airfoil can optionally reside exclusively in your menu bar, tucking away until you need it. Airfoil's built-in equalizer lets you tweak audio to get that perfect sound. Airfoil includes metadata with its stream, so you can see track titles and album art with compatible outputs. The free Airfoil Satellite app for iOS, Mac, and Windows can remotely control both Airfoil and many supported audio sources. Run Airfoil Satellite on your Mac, and you'll be able to stream audio from iOS to your computer. Team up Airfoil and Airfoil Satellite to send AirPlay audio from iOS to multiple outputs! Apple's HomePod speaker can now play more than just Apple Music. Stream any audio to it with Airfoil, adjust audio with an EQ, and even send to multiple HomePods in sync. All versions of the Apple TV can receive audio streamed by Airfoil, whether you've got a compact black tvOS-based AppleTV, or the original from way back in 2007. Licensed third-party AirPlay devices from companies like JBL, Pioneer, Sony, and many more are all supported. Sonos's AirPlay-compatible devices are automatically supported, and older Sonos hardware can receive audio as well. Google has a great line of Chromecast hardware, and Airfoil's a great companion for any of these inexpensive devices. Cast isn't just for Google hardware. Dozens of brand-name televisions and speakers are Cast-enabled, and Airfoil works great with them as well. 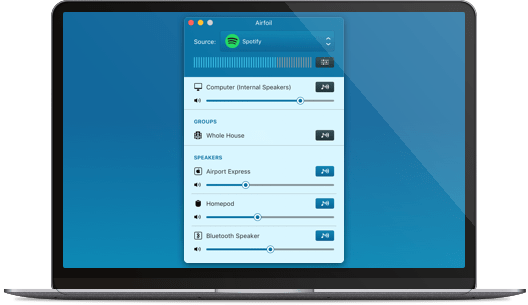 With the free companion app Airfoil Satellite, any Mac, Windows PC, or even Linux box can become an audio receiver for Airfoil. 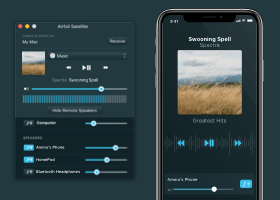 Get the free Airfoil Satellite for iOS or Airfoil Satellite for Android to turn any mobile device into a streaming audio receiver. Note: Before purchase, noise is overlaid on all transmissions longer than 10 minutes. Own an older version of Airfoil for Mac? Get a discounted upgrade to version 5. Airfoil is headed to your Downloads folder!